Our eye care professionals specialize in understanding the human eye, inside and out. From comprehensive eye exams, prescription eyeglasses and contact lenses, to detection of eye diseases and conditions that affect your vision, the Eye Doctors at Joseph and Bass Eye Associates are here to help. We understand how age and risk factors can affect vision over time for young and old, and the benefits and features of corrective lenses including eyeglasses and contacts. 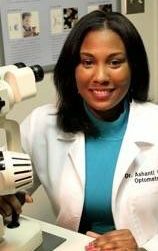 Dr. Ashanti Bass graduated from Howard University with a Bachelor of Science and received her Bachelor of Visual Sciences and Doctor of Optometry degrees from the Pennsylvania College of Optometry. She’s been in practice for seven years and her specialties include Dry Eyes and Geriatrics. Her favorite patient story concerns a patient who was sent for a routine exam and Dr. Bass convinced her to have retinal photos taken. Her exam and photos revealed an undetected choroidal melanoma that was potentially life threatening. After a swift referral to an oncologist, the patient was quickly treated and her life was saved. 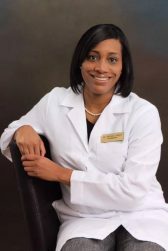 In her free time, Dr. Bass loves spending time with her family and friends and taking any opportunity to travel. She is a loving wife and mother of two young boys and a cocker spaniel.